Recent events on the Haram al-Sharif/Temple Mount have once again illustrated the immense difficulty that Westerners have in processing and responding to triumphalist Muslim behavior. In the case of the surveillance equipment they tried to install, Israelis were caught in a double-bind. If they left in the metal detectors, meant to decrease violence, it would provoke violence; and if they took them out, in order to calm that violence, it would encourage further aggression. Some Israelis and their supporters found this decision troubling, a capitulation to bullying that would only encourage further violence. It’s not enough to see this through Israeli lenses. If you don’t understand how the Palestinians and other Muslims see it, then you don’t realize the extent of the problem. In what follows, I will attempt to analyze this issue “against the grain.” As opposed to the superficial level of Israeli public discourse, which presented the choice as a rational one, designed to quiet the situation, the dynamics here are all about honor and shame, and the decision actually threw out any “rational considerations” in an effort to appease the anger of Muslims over a perceived insult to their honor and desecration of the site. Palestinians: This is an outrage and an effort to change the status quo. Israel: Arab Muslims have violated the status quo by smuggling weapons into the Temple Mount and firing on security guards who thereby violated the status quo and necessitated this response. Palestinians: This is unacceptable to our religion: it is a desecration. Israelis: There are metal detectors at the holiest of Muslim shrines, in Mecca, and if anyone desecrated the holiness of this site, it’s the men who smuggled guns in. We’re not doing anything any authorities would do, including Muslim authorities. At this point, one might have expected outside forces to urge the Palestinians to de-escalate and stop “defending the indefensible”: Arab “moderates” and Western diplomats alike. After all, wouldn’t a reasonable response by Abbas, admitting the problem and recognizing Israel’s legitimate security concerns, have reassured the UN General Assembly, which recently passed a resolution calling for “two democratic States, Israel and Palestine, [living] side by side in peace within secure and recognized borders”? And with some Israelis in the hands of angry Jordanians threatening a major diplomatic confrontation that could undermine one of Israel’s “best” relations with an Arab neighbor, and threaten the king’s status among his people if he ceded to Israeli demands, the best Netanyahu could hope for was a deal to get the Israelis back from Jordan and back down on the security apparatus. The result was a tremendous win for the hardliners. Everyone agrees, including right-wing Israelis. The very fact that Israel insisted their backing down was reasonable, and had “nothing to do” with the Jordanian deal, merely underlines their need to save face. The real question, however, is: win in what? A skirmish over the status quo on the Esplanade? Or a battle in a long war? And if the latter, what is that long war? Over the Haram? Over Jerusalem? Over Israel? Or beyond? The Palestinian message to Israeli society over all this is to understand the bitter truth: The Palestinians, the Arabs and Muslims will not accept the concept of sharing the Temple Mount between both Muslims and Jews. What particularly outraged me on that occasion wasn’t only the fact that they refused [to recognize the sacredness of the Temple Mount to Jews], but the way in which they refused: out of a kind of total contempt, an attitude of dismissiveness and arrogance. At that moment I grasped they are really not Sadat [!]. That they were not willing to move toward our position even at the emotional and symbolic level. At the deepest level, they are not ready to recognize that we have any kind of title here. I have many dreams and I believe they will come true, I love life and I love to make others happy, but what is my life is when they (Israel) murder women and children and defile our Al-Aqsa? The very language attests to the role of incitement in provoking such terror attacks: Israelis weren’t murdering women and children. But he, and other “knife intifada-niks,” were told they did, and in response, they kill women and children. This is an old story, now 17 years into the new century. It’s about hurt feelings and outrage, it’s about Western authorities doing everything to manage those feelings rather than challenge them. It’s about accusations of racism and Islamophobia, and about Islamophobia-phobics among those accused. It’s about progressive dupes adhering to a humanitarian racism and sound people saying nothing. This is the story of the year 2006, first with the Danish cartoon scandal at the beginning of the year, and then the Papal “insult” towards the end. In both cases, the triggering force was the product of war propaganda deliberately created to sow violence and hatred, and in both cases major western leaders took the path of appeasing the manufactured injury and the ensuing violent riots. Thus Muslims could rampage and kill because the pope called them violent (which he did not), and very few dared laugh. And, of course, since the Esplanade is the most contested, most apocalyptic piece of real estate on the planet, and the fault line in a confrontation between the West and Islam, the stakes are fantastically real. The Palestinian side is clear on its beliefs and aims: “This is ours. We will not share it.” The Israelis, more than willing to share, recognize that invasive desire and seek to slow it down with their surveillance. This is a common, and mild, response to guerilla-terror attacks. If anyone’s trying to change the status quo, it’s the “Palestinian” (Muslim) side. In any sane civic world, this is a no-brainer. Given that the first violation was a violation of Muslim sacred space by Muslims, it was up to Muslim religious leaders to condemn it, and point out that metal detectors are used throughout the Muslim world. Of course, what’s unacceptable to them is not metal detectors, but the fact that “filthy Jews” man them, indeed that they have any authority whatsoever over Muslims. The voice is the voice of the zero-sum, triumphalist, Islam, the sworn enemy of moderate Muslims and infidels the world over. And yet, the dynamics worked resoundingly in favor of the triumphalists on their (sub-violent) Jihad to take Jerusalem. The world made Israel (understand it had to) stand down, even though it would give victory to the extremists. 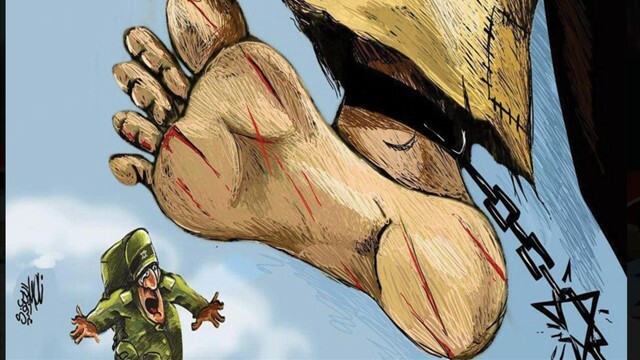 In the Arab and Muslim press, it’s a great celebration, in which the mighty winners (us) break the chains of the tiny, soon-to-be crushed, accursed enemy (them). Cartoon published in Jordan’s Al-Rad newspaper following Israel’s removal of security measures at the Temple Mount in July, 2017. Like the term intifada which refers to a great beast (Arab Muslims) shaking its hide to shoo off a fly (Israel), this image illustrates the Palestinian self-image: part of a great and powerful people, on the verge of crushing tiny Israel. In the world of honor-shame dynamics, this victory is huge. Jihadi global warming… up one degree world-wide. A big win for the Caliphaters who see this as the generation when a global Caliphate will rule the world. Not such good news for Western cultures, who on a global stage, backed away from their civilizational ally, forcing the one playing by modern democratic rules to appease the anger of those targeting those rules. Did it matter that Muslim anger was in large part fabricated by an industry of war propaganda that approved of the terror attack and did not want Israel to defend itself from subsequent ones? Did it matter that the security measures the Israelis sought to install would, hopefully, be part of any future global civil society? Should one not hope that reasonable Palestinian voices might speak up? Is there no journalist (other than right-wing Israelis) to point out the interests of civil society here? Which brings us to one of the banes of the new century, the paradox of humanitarian racism: certain groups, ethnicities, faiths, are free from all moral obligation; they are forces of nature. What they do cannot – should not – be rebuked. Humanitarian racism arises in an anti-racist effort to avoid any negative discourse about the “other” in order not to appear bigoted. Orientalism weaponized that Western (white) sensitivity to “others,” into a prohibition on criticizing the “others”, especially the Arab, the Muslim, even more especially, the Palestinian cause. Saïd often used racism as a way to silence criticism he felt “blackened” his people’s face. Suggest Palestinians are not ready for a democratic state, and you’re not a realist; you’re a racist. As a result, of this prohibition of criticism, when violence threatens in the Muslim majority world, Westerners retreat. They treat Arabs, rampaging Muslims, as a force of nature, a given. Moral reasoning does not work with them; and not just those who rampage; it also doesn’t work with allegedly moderate Muslim leaders who, despite their own interests, line up with the “Street.” When an American threatened to burn a Qur’an, SCOTUS Justice Stephen Breyer opined that doing something like that would so predictably bring on rioting and loss of life, that it might be possible to consider it the same as crying fire in a crowded theater. Muslim outrage and violence: a force of nature. The result of this humanitarian racism is to treat the results of poisonous and deliberately false Jihadi propaganda that constantly incites violence, as “realities” in the international “security equilibrium.” It doesn’t matter that it’s not true; they believe it. It’s part of reality, and nothing you say will change it. For most of the Arab world, the rights and wrongs of the case are beyond dispute: an innocent boy was murdered, and his blood is on Israel’s hands. Mention of contrary evidence or hypotheses only confirms the bottomless dishonesty of the guilty parties — much as Holocaust-denial theories do in the Western world. Note Fallow’s bizarre final clause that inverts the situation he’s trying to describe. Those who deny the grotesque reality of the Holocaust thereby reveal to alert Westerners their dishonest malevolence, while those who question the al Durah myth confront a fantastic blood libel, a 21st century version of the lethal narratives Nazis spread to produce the Holocaust, and which Jihadis try to use for their own Holocaust against the Jews. Thus Muslims can regularly accuse infidels of lying and dishonesty, but infidels cannot return the criticism. Hence Fallows’ bizarre analogic dyslexia. We understand the deep hurt and widespread indignation felt in the Muslim world. The freedom of the press, which entails responsibility and discretion, should respect the beliefs and tenets of all religions. When the pope was misquoted as saying Islam was inherently violent, Muslims rioted violently, killing innocents (including fellow Muslims), saying in effect: How dare you call us violent! And no one dared laugh. Responds the Western infidel: Who are we to question their rage? Talk to journalists about discussing the background of the status quo, which has shifted decisively towards absolute Muslim control of the Esplanade, and they can rattle off for you a long list of Israeli efforts to change the status quo, Yehuda Glick, Temple Mount Faithful… Remind them of the construction job the Muslims conducted around 2000, and the response is: “Oh, but that’s history,” as if the Waqf doesn’t consider that a tremendous victory in the effort to overthrow the status quo, which they savor every day. 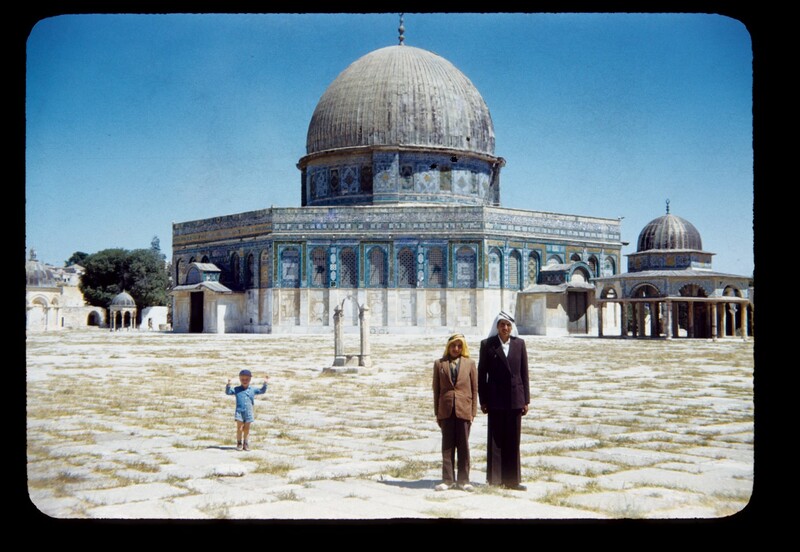 Look in vain in the WMSNM for articles documenting the long-term strategy of the Waqf to regain exclusive sovereignty over a site Israel granted her as a good-will gesture in 1967. After all, before 1967, the site held little interest for the Muslims. In the early years after 1967, infidels could go in the mosques when there was no prayer; and the Esplanade was open to the public. Now the Waqf has declared the entire site sacred. They tightly control access, keeping infidels, especially Jews, out, and by Israelis trying to control weapons from getting smuggled in. That hardly seems like a healthy situation, at least not to anyone hoping for a two-state solution of democracies living side-by-side. Can a journalist tell the story so it looks like Israel’s fault? Easily: it’s about Palestinian anger. And it so pleases the Palestinians to tell it that way. Why not? On the contrary, there are many “good” reasons not to tell it any other way. Few journalists seem eager to cross the Palestinians. The dilemma this incident presents to Israel is a paradigmatic one. Says the Caliphater: I’m invading; don’t resist. If you resist, I’ll go crazy with violence, so go quietly. Da’wa phase or Jihad phase? Your choice. This dynamic is obviously a burning issue in the “holy” land, where Palestinians constantly push for further concessions, where suicide bombing first got its sanctified start, and the threat of another explosion always hangs in the air. But infidels around the world need to understand that this is also how Caliphaters plan to defeat the rest of the Western world. And given their astonishing success on Western campuses, they have good reason to believe it will work. We face it now; we face it later. The longer we wait, the worse the payment for all involved. How do we face it now? Begin by acknowledging what we face, and keeping our eye on the ball. (It would obviously help here if our journalists were a bit more aware and courageous.) Stop fantasizing that if we’re nice enough and accommodating enough, they’ll calm down. All else – strategies and tactics – is negotiable. Submission is not.